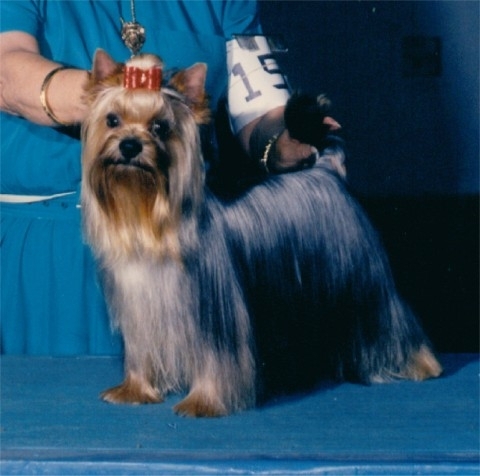 BJ is our most recent Champion, he is an American Champion and International Grand Champion. His lineage is Millmoor and Rothby. He is a Bouncer Senior grandson. 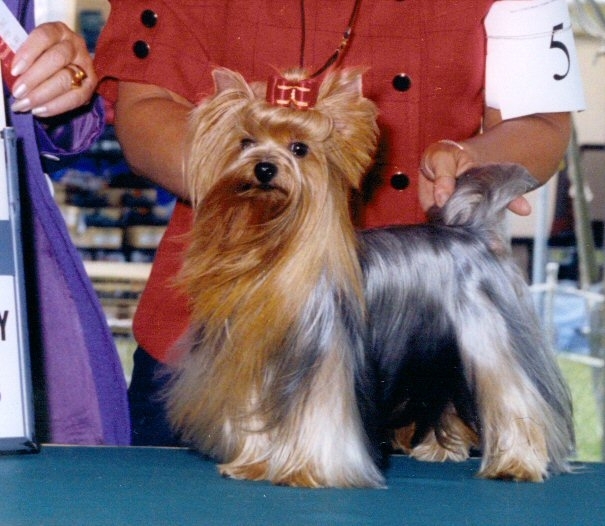 BJ is a mirror image of his grandfather, Bouncer Senior, in personality, disposition, heavy dark blue and gold silk coat, little tight ear set and excellent sound structure. 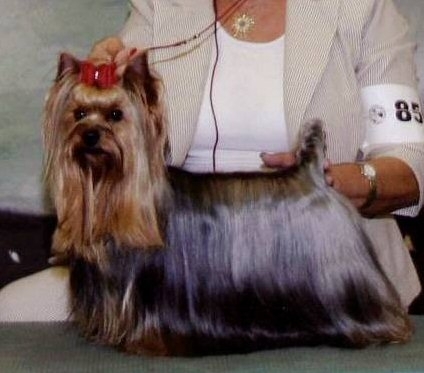 LOGAN is a Grand, International and National Champion with a beautiful Teddy Bear face, dark steel blue, heavy silk coat, dead level topline, excellent patellas, beautiful front and rear, perfect ear set, with beautiful dark eye rims. He loves to strut his stuff and has a very loving personality. He is Champion sired with bloodlines from Clarkwyn, Durrer, Pastoral, Rothby and Yorkboro. ROCKY is an American Champion! He has a gorgeous heavy silk coat, beautiful baby face, perfect little ear set, personality plus with a sweet loving dispostion. These traits are evident in his offspring. His father is an American Champion and is of Millmoor lineage. 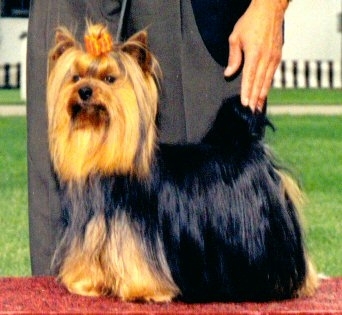 His mother's lineage is Glenmar and Rothby and she was champion sired. TONY is an American/Canadian Champion. He has a gorgeous heavy silk, dark steel blue coat. His gold is clear and very rich. He has excellent structure with beautiful dark eyes outlined with very dark eye rims. His lineage is Durrer, Rothby and Yorkboro. He has a very playful, sweet disposition. We currently have some of his pups with these same traits available at this time! 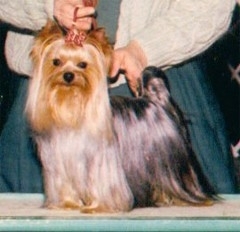 BLUE is an American Champion. He has a beautiful silk coat, dark eyes with dark eye rims, a short muzzle, excellent structure with a wonderful sweet disposition. His lineage is Clarkwyn and Wildweir. He has repeatedly been able to reproduce all these great qualities in his offspring. He is also a Grandson of C.D. Higgins! DANDY is an American Champion. 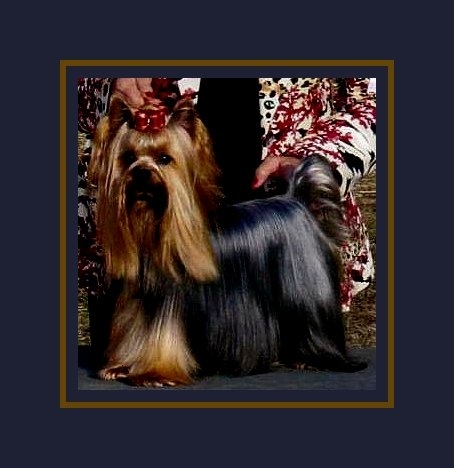 He is only 2 1/4lbs and has a beautiful heavy dark blue and gold silk coat, an adorable babyface, excellent tight little ear set, a dead level topline, excellent front and rear and fantastic patellas. He has personality plus, and the sweetest, most loving disposition!! His lineage is Dot's, Beholda, Clarkwyn, Clumore, and Rothby. Dandy has repeatedly been able to reproduce all these wonderful qualities in all his puppies! BOUNCER is an American Champion. He is of Millmoor lineage, and his direct lineage includes: CH Like You of Millmoor, CH Hold up of Millmoor, World International CH Ever-Trouble of Millmoor. Bouncer is aptly named for his bouncing personality. He has repeatedly reproduced offspring with gorgeous heavy silk coats, baby-faces, little, perfect ear-set and out going personalities. BJ, Rocky and Rocker are excellent examples of his quality offspring. Look for upcoming Bouncer grandkids in the show ring! 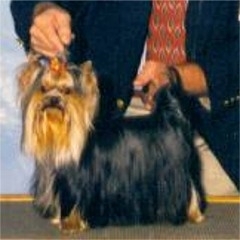 © 2000-2019 - Yorkmont Yorkshire Terriers.